"How many glaciers are there in the world, Ted?" "There are more than that in California. There are one hundred sixty thousand glaciers in the world, Ted. About sixty-seven thousand have been inventoried, but only a few have been studied with any care. There is mass balance data extending five years or more for only seventy-nine glaciers in the entire world. So, how can you say they're all melting? Nobody knows whether they are or not." Oh, where does one start?! There is just so much wrong with this. I suppose we can forgive Mr. Crichton for not being a statistician, but actually 79 glaciers can make a useful statistical sample--even for a population of over one-hundred thousand. But more importantly, he doesn't mention that although there may not be comprehensive mass balance data on that many, there is photographic and descriptive information on thousands of glaciers that is sufficient to determine whether or not they are retreating or advancing. And non-continuous mass balance information has been collected on hundreds. Even if you skip a few years, you know whether it has grown or shrunk. Yes, some glaciers are advancing, but the vast majority of glaciers on the planet are retreating--whether or not Michael wants to believe it. So perhaps it's not possible to determine with pinpoint accuracy the total amount of ice being shed by glaciers, it is very possible (in fact, it's been done) to determine what percentage of glaciers are retreating and what percentage are advancing, as well as estimate the total ice loss. 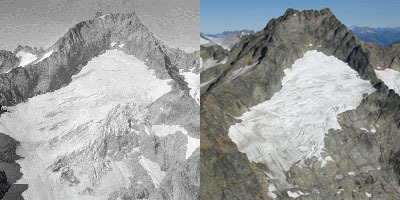 A world glacier inventory has been compiled since the 1970s, initially based mainly on aerial photographs and maps but now relying more on satellites. This compilation tracks more than 100,000 glaciers covering a total area of approximately 240,000 km2, and preliminary estimates indicate that the remaining ice cover is around 445,000 km2. The World Glacier Monitoring Service collects data annually on glacier retreat and glacier mass balance From this data, glaciers worldwide have been found to be shrinking significantly, with strong glacier retreats in the 1940s, stable or growing conditions during the 1920s and 1970s, and again retreating from the mid 1980s to present. And, of course, satellites make it possible to inventory glaciers pretty much everywhere in the world. And even though State of Fear was published in 2004, there were, in fact, satellites even way back then. Mr. Crichton obviously did not get his information from the best source of all, the World Glacier Monitoring Service, which was started in 1986, plenty early enough to have provided him with useful information.